One of the central rules of sleep training is that you should allow your little one to develop their abilities to fall asleep on their own. So it can cause a real “Should I or shouldn’t I” moment when you look at the baby monitor and see that your child has pushed themselves into an uncomfortable looking ball against the side of their cot. I see this issue predominantly in babies who have been either rocked or nursed to sleep in mommy’s arms and are then put into their cot already asleep. It may seem a little silly, but this is typically because they haven’t learned that they need to lie down in order for sleep to come easily. After all, up until they start the program, babies have been held in a certain position in their parents’ arms, which doesn’t allow for any kind of exploration or experimentation. They’re held in a nice, comfortable pose until they fall asleep, and then they wake up in their cot. This can lead to babies falling asleep in some pretty amusing positions when they are eventually left to figure it out for themselves, as they try to discover what sort of position they need to get into to get to sleep. Many will fall asleep sitting up, or even while they’re still on their feet, after a little time spent exploring their cot. So obviously, priority one with any baby is safety, so yes, you should absolutely go in and lie your baby on their back if they fall asleep in a position that’s not safe for them. “But won’t that wake them up and send the whole process back to square one?” you may be asking. Well, yes and no. There’s a good chance baby might wake up and want to interact with you, but if you lay them down and reassure them that’s it’s still time for sleep, then promptly leave the room, chances are they’ll find their way back to sleep before long. It’s not ideal, but it’s better than risking them falling over. What about those times when they manage to wriggle their way into the corner of their cot? There are times when baby might not be in a dangerous sleeping position, per say, but just one that looks really uncomfortable. 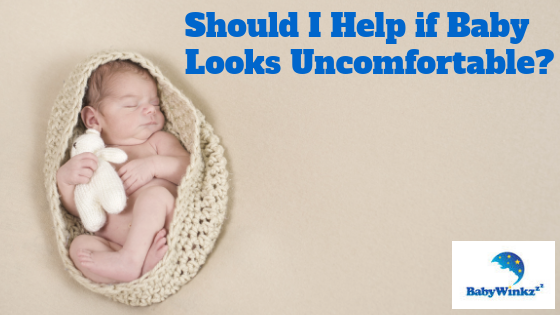 Well, what may seem uncomfortable looking to us grownups might be super comfortable to a baby. The most common scenario I see is babies lying against the edge of their cot, which we equate with sleeping against a wall, which is not something most adults are terribly fond of. But babies do seem to like to sleep while pushed up against something. It may be for a sense of security, or a feeling of being next to someone, but whatever the reason, they do seem to gravitate towards some kind of a surface to sleep against. And if they do end up a little smushed up against the side of their cot, or curled up into the corner, your best bet is to let them sleep. So if baby has a limb hanging between the bars of the cot, or has gotten into a position that might make it difficult to breathe, go ahead and reposition them. Just remember to make it as quick and quiet as possible, and don’t linger any longer than you have to in order to get them back into a safe sleeping position. As for what to do when your partner gets into a position that only leaves you seven inches of space on the edge of the bed, you’re on your own with that one. https://www.babywinkz.com/wp-content/uploads/2019/02/BabyWinkz-Blogs-11.png 315 560 Judy - BabyWinkz https://www.babywinkz.com/wp-content/uploads/2018/03/logo-babywinkz-300x138.jpg Judy - BabyWinkz2019-02-13 10:07:592019-03-08 12:02:42Should I Help if Baby Looks Uncomfortable?